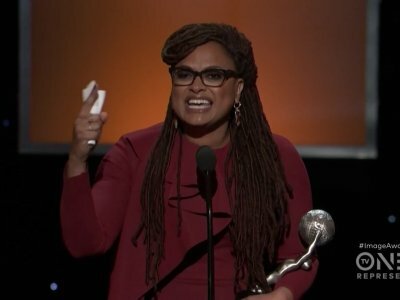 LOS ANGELES (AP) — A jubilant Ava DuVernay was named entertainer of the year at an NAACP Image Awards ceremony that focused on the black community’s power to create change. DuVernay lauded other black artists from the stage as she accepted her award Monday night, naming writers and directors such as Shonda Rhimes, Gina Prince-Bythewood, Kenya Barris and “Black Panther” Ryan Coogler. Anthony Anderson hosted the ceremony at the Civic Auditorium in Pasadena, California, on what would have been Martin Luther King Jr.’s 89th birthday. While his politically tinged monologue poked fun at the presidential administration and Omarosa Manigault, others used their time onstage to encourage more civic involvement and the fight for social justice. Producer Will Packer took a dig at President Donald Trump’s recent comments about immigration as the producer accepted an award for “Girls Trip,” which won for outstanding film. “Sisters, especially the ones from Haiti and Africa, we love you as your brothers,” he said. The six women declared support for the Time’s Up initiative to stop sexual harassment and gender discrimination and urged viewers to speak up at the polls as well. “Then we have the ability to shift the imbalance of power,” Smollet-Bell said. Barris’ show “black-ish” was the night’s big winner. The ABC hit was named best comedy series and took acting honors for stars Ross and Anderson. “It’s an extraordinary thing to be able to show what a beautiful black family looks like on television,” Ross said as the cast accepted the comedy series honor. “Power” was named best drama series, and star Omari Hardwick won for dramatic actor. “I don’t think you’re allowed to beat Denzel Washington in acting competitions,” said Kaluuya, who bested Washington for the prize. The 28-year-old actor thanked his mom and “Get Out” writer-director Jordan Peele. NAACP president Derrik Johnson asked viewers to text in their pledge to vote in 2018 before presenting the President’s Award to Danny Glover. “Civil rights and labor rights have always been one and the same,” he said. The special awards provided some of the night’s most poignant moments. Labor organizer William Lucy received the Chairman’s Award for his more than 40 years of service. Beyond his union leadership, Lucy was also an activist who fought apartheid in South Africa. Another arresting moment in the show came during singer Andra Day’s chilling performance of Billie Holiday’s “Strange Fruit.” Rapper Common joined her for their song “Stand Up for Something,” and the whole audience rose to its feet.